Leia Pierce and her son, Jamel Myles, who died by suicide. 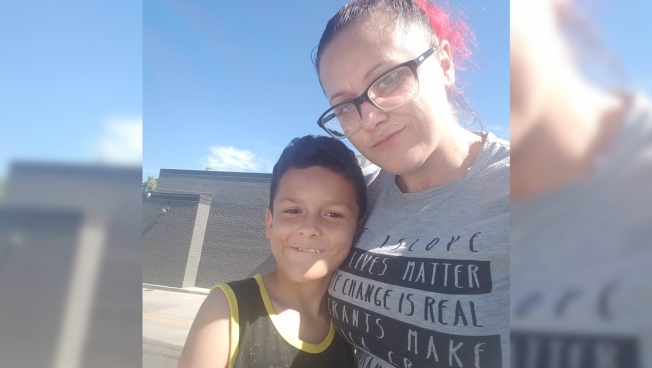 A 9-year-old boy killed himself in Denver last week, soon after the start of school. His mother says he'd been bullied after coming out as gay, NBC News reported. Leia Pierce found the body of her fourth grader, Jamel Myles, on Thursday and unsuccessfully tried to revive him. He'd come out as gay this summer, she told the Denver Post, and told Denver NBC affiliate KUSA that he was being bullied for it. “I lost a reason to breathe ... my heart, my sunshine, my son... he was being bullied and i didnt know. Not till it was to late," she wrote on a public Facebook post the next day. On Monday, the school district sent a second statement addressing Myles' death, which was ruled a suicide, saying the district is "deeply committed to ensuring that all members of the school community are treated with dignity and respect, regardless of sexual orientation, gender identity, or transgender status." The Trevor Project offers multiple resources for LGBTQ youth in crisis, including the TrevorLifeline, a nationwide, 24/7 crisis and suicide lifeline: 866-488-7386. Anyone in crisis can call the National Suicide Prevention Lifeline at 800-273-8255 or reach out to the Crisis Text Line by texting "Home" to 741741.